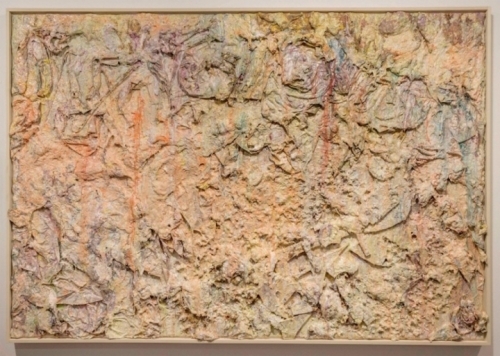 In comparing Jean Dubuffet’s early paintings from the 1950s with recently resurrected works by American color-field painter Larry Poons from the late ’80s and ’90s, there is a quandary that appears somewhat daunting, especially given the relative, though pronounced, cultural differences between them. The quandary relates to the mystery of what these two artists have in common. We know that both are painters, but culturally, they appear to have been informed by different attributes regarding scale and color, line, and force of visual impact. At the Loretta Howard Gallery, these disparate artists are comparatively presented side by side in Jean Dubuffet and Larry Poons: Material Topologies. I am somewhat dissuaded by the comparison, but it is nonetheless engaging, if not an urgent reminder of how significant painting can and should be. Who would have thought that the “art brut” style, based on the art of the insane and introduced by Dubuffet shortly after World War II, would eventually find an affinity with the gritty, unconventional large-scale paintings Poons made three decades later when he began using chunks of cut-foam on the surfaces of his canvases? This intriguing comparison suggests that the history of late-modernist painting still remains open in its search for primal origins. Dubuffet made his point clear in his famous “anti-culture” lecture at the Chicago Arts Club in 1951, where he advocated going against the conventions of beauty in art and in favor of more deeply embedded emotional and traumatic revelations. Dubuffet developed the “art brut” method of painting in Paris in the mid-1940s, which he initially discovered in the writings of Swiss psychiatrist and art historian Hans Prinzhorn. Inspired by Prinzhorn’s studies of aberrant patients, Dubuffet went on to observe paintings by insane inmates and disturbed children, as well as objects produced by “primitive” outsiders who were unaware that what they were doing might be considered art. In all cases, Dubuffet gave serious attention to the errant materials these artists used, including earthly and bodily effects. Eventually the artist began to mix these materials into his oil pigments, which provided the ground for his paintings, further endorsing the primal “hands-on” effect that becomes visible in the artist’s tactile organization of space. According to Dubuffet’s “anti-cultural” address, the “art brut” works included in his show from 1951–53 are the beginning of a fierce positioning whereby the painter no longer expects to emulsify beauty — that is, to literally support the glow of color on the surface through the use of emulsion. At the time of his lecture, the artist was working in New York and had just had a successful exhibition at the Pierre Matisse Gallery in Midtown. Even so, there was little doubt that his paintings were not well understood. He was never an advocate of expressionism but held a vision of his own, one more Jungian in his quest to understand the unconscious, which he aspired to do through painting. This in itself would alleviate the burden of the mural-scale paintings that occupied the attention of American abstract expressionists in the early 1950s. Yet to view this exhibition of Dubuffet’s paintings in relation to the brilliantly defiant Larry Poons is another story. I would hesitate to say that Poons has ever been “anti-cultural,” as I recollect his paean to Beethoven at a panel several years ago. At the time, Poons related works by the composer to significant paintings, which he has seemingly continued to pursue on his own abstract terms. 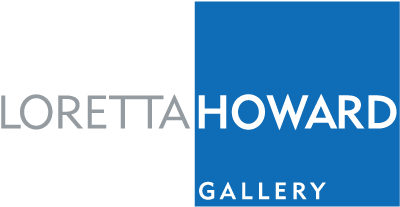 The comparative positioning of the two artists’ paintings at Loretta Howard Gallery inadvertently recalls the way contemporary modernism used to be taught using “slide trays” filled with 35m celluloid images projected images side-by-side on a large screen. Indirectly, this bilateral representation intended to offer an academic analysis of the pictorial parts of each painting in relation to a “composition” or presumed “coherence.” Apparently, studying paintings comparatively was considered a more effective approach to discovering “taste” than observing them in isolation. But in the case of the current exhibition, a second glance at the paintings by each artist, built from multifarious scraps of objects, synthetic matter, dirt, and junk, gives these varied surfaces a weirdly consecrated resonance. Possibly due to Dubuffet’s more intimate scale, one enters more quickly into his pithy, ambiguous landscapes than into Poons’ sprawling topographic cornucopia. Both artists, in fact, veer toward the unbridled limits of profound insolence, which suggests that their paintings fly in the face of the status quo in a way that few painters in recent years are capable of doing or even comprehending. When I glance at Poons’ “Cry Le June” (1990), I am taken by the specter of conflict giving way to inevitable sublimation; when I leap into the entrails of Dubuffet’s “Soleil san Vertu” (1952), I sense pangs of conflict gliding up through the dark moss. There is nothing to prove in these paintings other than confirming that the emotions they project contain their own reality, which we are unable to pin down in any absolute way. Both painters’ works arrest our gaze even as we might struggle to pull away, whether we are groping for clarity in Poons or freedom in Dubuffet. There is a heightened, inexorable quality about these surfaces that defies a middle-class (bourgeois) reading of their art. This was precisely the point that Dubuffet expressed in his “art brut” paintings and openly stated in his Chicago lecture. In neither case are they exactly what New York critics from the 1950s often called “all-over” surfaces — a blithe bourgeois reading, to be sure, and foreign to the intentions of Dubuffet, in particular. In their wake, this assortment of paintings is harrowing in the sense of a force that pulls us inward, both mentally and physically. As Aldous Huxley recounts in The Art of Seeing, such experiences — as I understand the task of looking at paintings — utilize the retinae as “windows to the brain.” Indeed, in these remarkable anti–status quo works by both Poons and Dubuffet, we are seduced into the mire through a subtle though deferred madness. Here I reflect on the surfaces of Poons’ “To Speak” (1987) and Dubuffet’s “The Gallant Pursuit (le galante poursuite)” (1953). Both are masterworks of a kind, as both raise the inconceivable questions not only of where one begins to see, but where and when one stops seeing. The eye brings us beyond what we can easily comprehend. We are taken into the realm of what the existential writer Samuel Beckett once called “the unnamable.” These paintings are consciously abject encrustations of pigment, sumptuously delivered. Their connections are perhaps more implicitly rendered than explicitly exposed. While diverse in style, the content delivered in the few works of these artists on view appears remarkably similar.